Home Numerology Angel Number Meanings Quadruple Digit Angel Numbers Meanings Angel Number 1414 Meanings – Why Are You Seeing 1414? You grab a magazine and a snack in the morning and the total comes to $14.14. A midday meeting overruns and you are starving. You glance at your phone to see the time and it read 14:14. In the evening you receive a phone call out of the blue with an interesting offer, and you notice that the number ends in 1414. Is this all just some strange coincidence, or does it have some deeper meaning? Learn all about the quadruple digit Angel Number 1414 meanings below. What does the Angel Number 1414 mean for love? If we find ourselves noticing the same numbers over a short period of time, it could be that we are being nudged to notice Angel Numbers. Angels will sometimes wish to send us messages in response to questions that we have on our minds. In most cases they cannot communicate with us directly, so instead they will nudge us to notice things in the world around us. Numbers make excellent messengers because they are ubiquitous in the world around us and therefore always available in our time of need. Numbers are like the DNA of the universe, which hold consistent and true across time, culture and nature. As the essential building blocks of the world, they carry essential information about the world, much like human DNA. 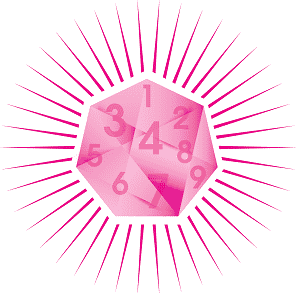 Angels can use the specific meanings of different numbers to send us specific messages. What could the Angel Number 1414 be trying to tell you? Sometimes situations can leave us feeling powerless, and we give our power to determine the outcome of things over to other people. At other times we know that the ball is in our court, but indecision or fear leaves us paralysed to act. If the Angel Number 1414 shows up, it is a certain sign that now is the time to take action. It reminds you that you not only have the power, but the responsibility, to shape your own world. Don’t hesitate for any longer, or the opportunity for the best outcome may pass. Some people seem to have all the luck, while we sometimes feel like nothing ever goes our way. But luck is nothing more than being ready to seize an opportunity when it comes your way. The best way to be prepared is to have a strong foundation from which to leap. Knowing what you want and knowing your values allows you to know when to leap and in what direction. Having a stable financial or family base gives you the confidence to take risks, and win big. 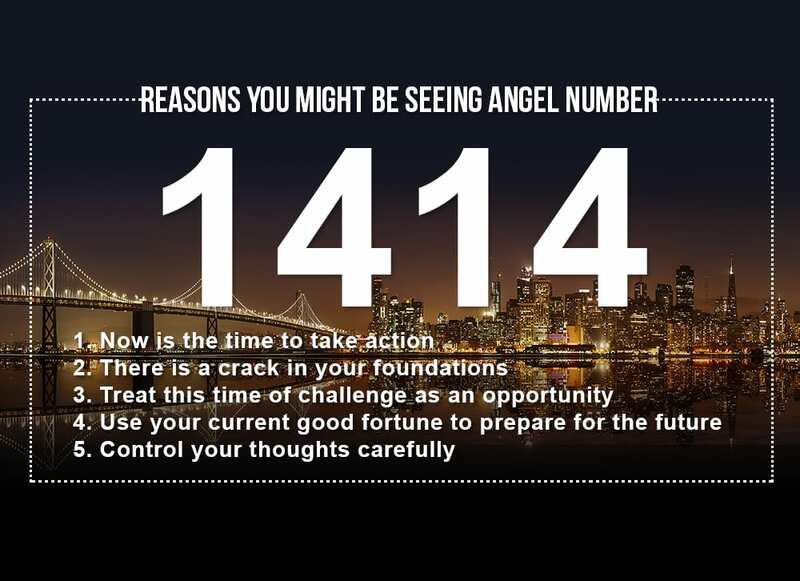 The 1414 Angel Number can show up to tell you to attend to your foundations, so you can be ready for the next lucky break. Everyone struggles with challenges in their lives. But rather than being things that we need to get through, they can be the things that define us. And when a challenge is overcome, we do not find ourselves in a continual state of bliss and satisfaction, rather we find ourselves faced with new, hopefully better challenges. The Angel Number 1414 can appear to remind us not to despair in the face of a certain challenge, but see it for the opportunity that it is and take positive action. In opposition to the previous example, sometimes we encounter a time of good fortune and we may think that all of our chickens have come home to roost. But the vast majority of us are designed to always want more. When we reach a certain goal, we quickly set our sights on our next desire. The appearance of the repeating number 1414 can be a reminder not to take this time of prosperity for granted. Fortune attracts fortune, but only if we let it. Take this opportunity to build on what you have already achieved so that you can rocket on to your next goal. It is not just our actions that shape the world in which we live, but our attitude. Often how we choose to respond to certain incidents has a greater impact on our lives that the incident itself. We can see missing out on a job opportunity as a rejection, or as a challenge to find something that is a better fit for our talents. 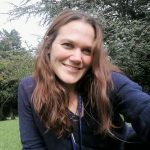 We can see separating from a partner as a loss, or as an opportunity to find someone with whom we can build the type of relationship that we want. When the Angel Number 1414 shows up we are reminded to guard our thoughts against negativity and defeatism. Embrace a growth mentality. When it comes to love, seeing 1414 suggests that we need to think about how our romantic relationships are aligning with our fundamental needs. If we are in a relationship, perhaps something about the way the relationship has been established means that it is not giving us something essential that we need. It is time to sit down with our partner and iron out the issue. If we are looking for love, it can suggest that we need to pay a little more attention to things that go beyond the surface. Perhaps it is time to consider whether sparkling eyes or common values are more important to us. While Angels will reveal numbers to us to pass on important messages, it is up to us to decipher their meaning. Always pay attention to what you were doing or what you were thinking in the moment that you saw the number. They will be revealed to us within contexts that help us decipher them. Trust your intuition to unravel the unique message that 1414 has for you. Taking a closer look at the Angel Number 1414, it is a combination of the number 1 and the number 4, doubled in intensity. The number 1 carries particular force as 1414 also reduces to the cardinal number 1. In this case 1+4+1+4=10, and 10 is further reduced to 1+0=1. The number 1 is the first cardinal number and as such is the number of new beginnings. It is also linked with the beginning of the universe itself and the creative forces that shape the world. However, we are not meant to think of these creative forces as something that exists beyond ourselves. Each of us contributes to the shape of the universe with our own actions and decisions. Our choices have a profound impact on our own lives, and knock-on effects for the universe as a whole. The number 1 calls on us to take charge of our own existence through our choices, and to be conscious of the far-reaching consequences of our actions. The number 4 is linked with the idea of foundations, and if it is shown to us, its message has something to do with the foundations on which we have built our lives. This could be material foundations such as work and home, community foundations such as family and friends, or personal foundations such as values and beliefs. Usually it suggests that there is a crack in our foundations that needs attention, or that some part of our foundations is no longer serving us and needs renewal. 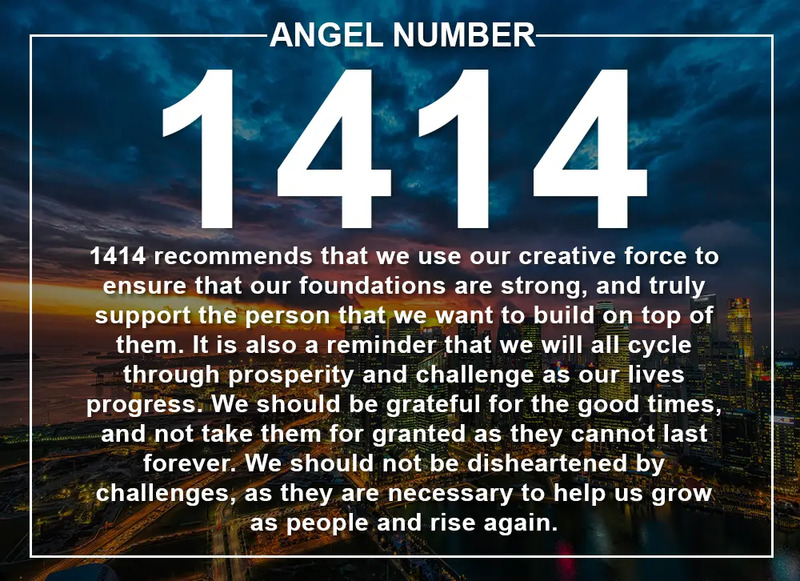 The Angel Number 1414 is an empowering symbol as it is strongly suggestive of the power we have within our own lives and our ability to shape our world. It simply requires vision and determination. It behoves us to remember the importance of a strong foundation, as it is the thing on which everything else stands. 1414 recommends that we use our creative force to ensure that our foundations are strong, and truly support the person that we want to build on top of them. Finally, 1414 is also a reminder that while we have the power to shape our lives, we cannot always be at the top of Fortune’s Wheel. We will all cycle through prosperity and challenge as our lives progress. We should be grateful for the good times, and not take them for granted as they cannot last forever. And we should not be disheartened by challenges, as they are necessary to help us grow as people and rise again. Do you seek guidance and insights into the past, present and future, with regards to relationships, love, or money? 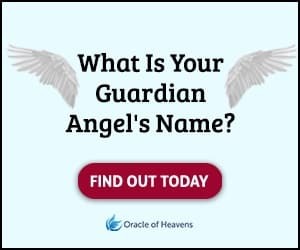 If you are frequently seeing the 1414 Angel Number, take this popular free test to see whether your Guardian Angel is trying to send you an urgent message. Why do you keep seeing 14:14? The Angel Number 1414 is an empowering symbol. Are your foundations strong? Learn its important meanings here!